I have a very exciting post to share with you all today. As I mentioned in this post, I’m working with The Northern YA Literary Festival to help spread the word about the fab event. Since I wrote that post, they have added another event to the line-up and I am getting even more excited for it. It is going to be such a fantastic day! One of the events is called ‘Feminism in YA’ and it sounds spectacular. There are a whole host of brilliant authors involved, including Annabel Pitcher. I’ve got my ticket waiting for me so when the team at the festival asked if I’d like to chat to Annabel, I immediately said yes with an embarrassing amount of keenness. 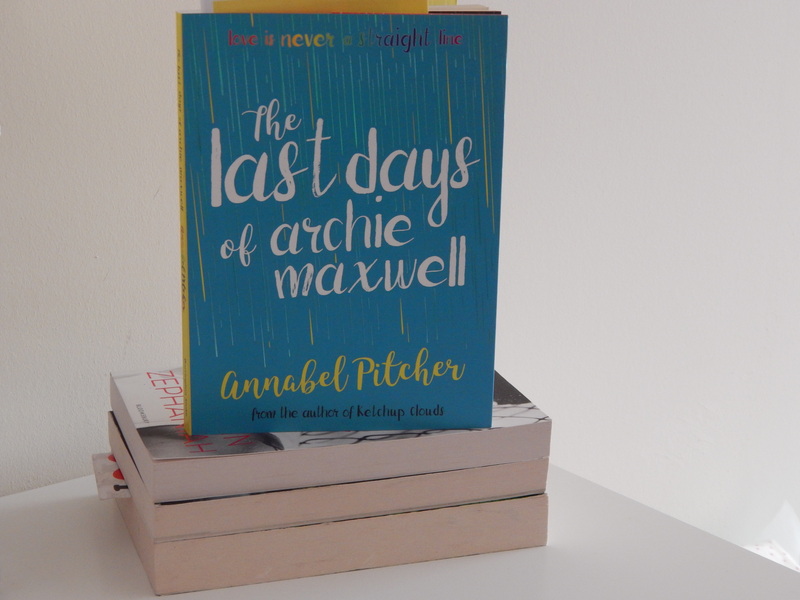 I read Annabel’s The Last Days of Archie Maxwell and LOVED it so having the opportunity to chat with her was brilliant. I had plenty of questions for her about the book, YA and the festival itself – she did not disappoint with her answers! What drew you to Archie’s story? I had the seed of the idea for a long time. I wondered what it would be like to decide to take your own life and to plan it all meticulously, only to turn up at the designated place to find someone else with the same idea. Would you try to save them? I think you probably would. The instinct to want to intervene would still be there for most people. How would that affect your plans that day? What would the conversation be between the two individuals? That was one element of the story that interested me. The other thing I was drawn to was the role of teenage boys in today’s world, something I became fascinated by after the birth of my own sons. We talk so much about a girl’s role in society and how that is difficult, but it is challenging for young men too. I wanted to write about a boy who isn’t allowed to show his feelings (as many aren’t) when he finds out a family secret, and how is anger and confusion spirals out of control and leads to suicidal thoughts. How do you take a book from idea to finished product? What is your writing process like? Imperfect, messy, chaotic and time consuming! I never plan out my stories at the start. Voice and character are everything to me so I just need to plough straight in and get going without worrying too much about the events of the narrative. Then, when I have my main character in place and the book is ticking along nicely, I start to think about what might happen. Obviously, I have some sort of vague idea but I don’t have any detailed synopsis at the beginning. I have tried that in the past and I just ended up ignoring the whole thing. For me, the story comes alive in the writing, and I can’t predict which way it might go before I am in it with my characters. It means I make a few wrong turns and have to redo things and go back a couple of chapters to make sure the subsequent chapter makes sense, but it works for me! This book deals with some heavy topics; was it difficult to write? Not at all. I think it would be harder to write a book in which nothing much happens! The topics added the tension, drama and intrigue so they were essential to the narrative. The only tricky thing is to make sure the so-called ‘issues’ don’t dominate too much. No one wants to read a heavy, issues-led story. They want three dimensional characters, all sorts of themes, light and shade and some humour. It can be hard to get the balance right but I never feel daunted by including hard-hitting topics. I think you can explore most things in fiction as long as you lead with character and allow the story to breathe. Honesty is a key theme in the novel. Why did you choose to focus on that? Honesty is always interesting because not many people in life really ARE that truthful! We all tell lies, all the time, from pretending to be fine when we’re not if someone asks, to harbouring secret fears, desires and plans that no one but ourselves are privy too. We live in such close contact with others now through social media, where we construct our perfect life stories, but that isn’t the narrative we tell ourselves at night when the lights are off. I think this – having a different public and private persona – is particularly marked in both adolescence and parenthood. As a teenager, you have a different inner life to the one you reveal to your parents, and the same is true of parents in relation to their offspring! I wanted to explore this in the novel. As a writer (and a reader) what is the appeal of YA for you? It’s funny because that makes it sound as if it’s a conscious choice to be a writer or reader of YA. And it isn’t. I write it because I am, in some totally mysterious and unknowable way, drawn to writing it. And I pick it up off the shelf to read for the same reason. I love it. It speaks to me. It always has and I suspect it always will. What are you most excited for during The Northern YA Literary Festival? A fantastic day of debate and conversation in the mighty north of England (I am a Yorkshire girl!) celebrating all there is to love about YA fiction. Thank you to the team at The Northern YA Literary Festival and to Annabel for such a great post!